Directory Opus uses the industry standard InstallShield installer. Despite InstallShield's ubiquity and $3000 price-tag, there are still sometimes problems and conflicts with it. Below is a list of issues that people have encountered with the Directory Opus installer, and how to solve them. The installer gets stuck and stops making progress, typically around 70%. If you open Task Manager you may find one or more ISBEW64.exe processes stuck in the task list. If you have a program called Airfoil installed then it may be to blame, although newer versions are probably fixed as we have not heard of this problem in some years (as of 2016). Airfoil allows you to pipe audio to Apple iOS devices which act as wireless speakers, but it has also been known to cause conflicts with some installers and other software. We recommend that you uninstall Airfoil, then reboot and try the Opus installer again. You can probably reinstall Airfoil afterwards, but remember that you may need to remove it each time you install/update Opus or other software, at least unless/until Airfoil is fixed to prevent the conflict. This error is not InstallShield's fault, but the error message is not particularly helpful either. An existing shortcut to Directory Opus on your desktop cannot be replaced. This is usually because the shortcut's read-only attribute has been set. It can also be due to file permissions. This is the easiest case to deal with. If there is an existing Directory Opus shortcut on your desktop, delete it and run the installer again. The Public Desktop (or, if you are on Windows XP, All Users Desktop) folder has incorrect permissions. The folder should allow Administrator accounts to create files but if that is not the case then the installer will fail when it tries to add a shortcut to the public desktop. 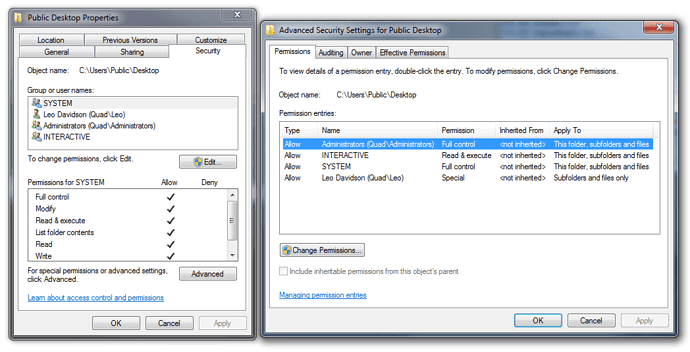 The folder permissions for the Public Desktop folder should give Administrator full control and should not deny any permissions to your own username. You should not modify the folder permissions unless you know what you are doing, as doing so incorrectly can result in problems (like this one ). Ask for help if you need it. First, make sure that you rebooted after installing the new version. If you still get the error after a reboot then, unfortunately, you have struck a fairly rare problem where, for some reason, the installer does not replace some of the old files. So far, the only reliable way we have found to fix this is to completely uninstall Opus and then reinstall it again. If you already have a backup of your configuration, you can just restore this once the new major version is reinstalled. You can try reinstalling the old version (e.g. Opus 9) first, then make a backup of your configuration, and then uninstall the old version and install the new version (e.g. Opus 10). This seems to be caused by a bug in InstallShield. Methods to solve this are as follows. First, make sure Explorer is set to show hidden files. From the ribbon, click View, then check Hidden Files. From the menu bar, select Tools > Folder Options / View / Show Hidden files and folders then click OK. Locate the InstallShield folder there, if one exists. If found, delete the InstallShield folder. Locate the Installshield Installation Information folder. If you do not see it, the folder is probably hidden. Did you follow the show hidden files steps above? Enter the Installshield Installation Information folder. Locate the folder whose name ends in BF50D and delete it. Paste %TEMP% into Explorer's path bar at the top. Close all web browsers and programs except Explorer. This includes the browser you are using now. Locate the folder whose name ends in 12EF1 and delete it. Once you have completed these steps, reboot and try installing Opus again. Anti-virus may block the installer from writing the new exe and dll files to disk. This is more common with brand new versions, where anti-virus is sometimes more paranoid about files it has not seen on lots of machines before now, but can alo happen with old ones. You don't usually need to turn off anti-virus to install Opus, at least with good anti-virus, but it's worth looking at your antivirus's log if things are failing, to see if it is blocking things and not telling you via an alert. These generally don't do anything useful (in our opinion), and if they go wrong they can completely break the installer by putting things in an unsupported state which should be "impossible". If you're having problems, we recommend removing such tools, and against using them in general. If you need to uninstall Opus, you can find the official uninstaller in the standard Windows Settings UI or Control Panel, filed under GPSoftware Directory Opus. The installer needs to use the TEMP folder, and some people have found that moving it to a non-standard location confuses InstallShield. If you have moved your temp folder, please try resetting things to default. If you run set t from a command prompt it will report the current TEMP and TMP locations, which should both point to C:\Users\<username>\AppData\Local\Temp on Windows 10.